HitBTC is an intuitive and reliable exchange, allowing users to trade some of cryptocurrency’s most popular assets. HitBTC is a Europe based cryptocurrency exchange that began in 2013, and now is operated by HitTech limited, based in Chicago. 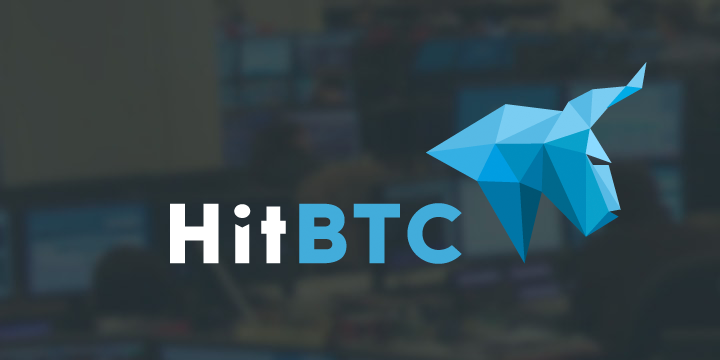 Unlike its name, that involves the abbreviated BTC (Bitcoin) in it, HitBTC is actually a multi-currency exchange instead of just a Bitcoin-oriented platform. It supports more than 400 cryptocurrencies, including all the major crypto-assets. HitBTC provides various good features, one being an API that third parties can use on their sites, however where it does fall short is having a dedicated mobile app. Not many exchanges do have them but the larger ones like COinbase do, we think hitbtc is closing in on that territory. Not having an app does make the user-base limited, with users either having to use their mobile web-browsers or desktop to access the website. The HitBTC exchange supports and accepts Fiat currencies to buy cryptocurrencies. This feature already puts it in front of a lot of other exchanges because it opens them up to first time investors, whereas the likes of Bittrex have to rely on those newcomers going somewhere else before making their way to the Bittres platform. This review aims at make it easy for the user to decide which crypto-exchange they would prefer to use. HitBTC was founded by using 6 million euros of venture capital money. It has not been revealed yet, who was the founder of this website, or the mastermind of this platform. It looks to simply be a venture by a company who thought it would be a good idea to start a cryptocurrency exchange. The Chicago based company, Hit Tech limited were responsible for HitBTC. There was also some association with Cryptopay however that relationship was cut short and the Cryptopay founders decided to exit from any involvement in the platform, a clash of direction is probably the nicest way to put it. Despite any difference in opinion, Cryptopay tokens are still listed on HitBTC exchange, meaning that the relationship is not completely over. HitBTC was hacked once in early 2016. Although not to much came out about it in the press, users were vocal of their displeasure on online forums and review platforms. HitBTC did not cover themselves in glory as they refused to provide any information about the incident. Many users complained of their coins being ‘lost’ on the platform, as well as delayed or no withdrawals from the exchange. The fees structure of HitBTC exchange is different and fairly competitive when compared to other exchanges out there. They charge 0.1% from takers (sellers, who place ask orders), and they provide 0.01% rebate to makers (buyers, who place bid orders). This mechanism or design is followed nowhere else and very much a way of inviting users to buy and not to sell their coins. Every exchange charges both sides of the trade in some form or another but HitBTC is the only one to offer a rebate when buying. HitBTC supports more than 400 cryptocurrencies including the major ones – Bitcoin (BTC), Bitcoin Cash (BCH), Ethereum (ETH), DASH, Ripple (XRP), Litecoin (LTC), VERI (Veritaseum), XMR (Monero) and many more alt-coins that are not be available on other crypto-exchanges. HitBTC exchange does not have a minimum deposit, which means you can start trading with small amounts before you get more confident. A large benefit of using HitBTC is the low fees. The transaction and trading fees are 0.1% which is way lower than some other exchanges demand. HitBTC provides a medium to exchange government issued currencies for cryptocurrencies. It provides trading in multiple traditional currency to cryptocurrency pairs and cryptocurrency to cryptocurrency pairs. This will attract first time cryptocurrency traders because they can turn fiat into crypto very easily. HitBTC has over 400 cryptocurrencies available for trading. This huge array makes it a one exchange for all, it will have all the big ones; bitcoin, ethereum etc and also lots of the new up and coming coins; reddcoin, golem etc. Registration on HitBTC is smooth and fast. You just need to enter your email, put a strong password in and you will get a verification code or link sent to your email within seconds. To maintain integrity and differentiate accounts, HitBTC provides three levels of accounts – General, Verified and Qualified. Each account has its own advantages and benefits. The more information you add, the higher verification level you reach. The higher the level the more will be the advantages you will get. Basically the more you show the more you get. HitBTC allows users to be anonymous. If you do not want to list your true information, you may register yourself using a pseudonym, however you will not be able to get to some of the higher levels of account because of a lack of verification. The interface of HitBTC is perfect for seasoned traders and skilled crypto-experts. It’s an information rich platform, which ensures to retain high-end traders for the long-term. HitBTC provides its users a mandatory 2FA (two factor authentication) to secure your account with an added layer of protection. They also have high-end security features enabled for their website, adding yet more security. HitBTC exchange only gives the option of trading in USD, EUR and GBP. No other traditional/FIAT currency is allowed. Users can only exchange these three currencies for crypto-assets. The only way through which you may make deposits in your HitBTC account is through bank transfer. They do not allow deposits through PayPal, debit card or credit card. Basically meaning there are two deposit methods; bank transfer or through cryptocurrency from an external wallet. With the recent rise in banks stopping people buying cryptocurrencies with credit card, hitBTC may have saved themselves a trick here. The interface might be good for expert traders, but it is not meant for newbies or first-timers. They will find it extremely confusing and might even experience loss if not used properly. The verification process is time consuming. A general account verification can take up to 10 days during high traffic and congestion time. Without verifying your account, you may not be able to trade in as high volume as you might want to. Not ideal. It has no mobile app, although it does offer third-party APIs for mobile phones, but a dedicated app would be better! This means that you can only access through a web browser on your phone, which frankly we would advise against or via a computer, this all means that you can’t trade on the go. For beginner we would not advise trading on the go but for experts, they will want this functionailty. Another downside of HitBTC is slow withdrawals. Users often complain about withdrawals taking too long time. Sometimes, even as much as a month! Customer support of HitBTC exchange is not supportive or responsive. Many complaints from users reveal about the slow and time-staking process that the customer service executives indulge in. Many others also reveal that their grievances are still pending. HitBTC was hacked in early 2016, which raises a finger over their security features, and the future possibility of an attack. This is a reason we would advise not to use HitBTC as a wallet, but just as an exchange. It is better to avoid storing your crypto-assets in any online exchange, keeping your coins in an offline or hard-wallets will increase the security. While registering for a new account on HitBTC is easy, verifying your account can take some time. Do not expect a quick turn-around from HitBTC’s side, users often complain about a very slow verification process. There are three types of accounts that HitBTC offers. The first one is – GENERAL account, in which you may deposit any cryptocurrency for free. But there is a daily withdrawal limit of EUR 5000 worth of cryptocurrency. However, if you belong to the General verification tier, you cannot deposit fiat currency (USD, EUR or GBP). The second tier is VERIFIED, in which you get free deposits for cryptocurrency and maximum of EUR 25,000 daily withdrawal limit on crypto-assets. You can also deposit Fiat currency, up to $2000 (EUR or USD) per week and $10,000 per month – both for withdrawals and deposits. The final tier is QUALIFIED, in which you do not need to pay for any crypto deposits. With this account, you may withdraw more than $25,000 worth of cryptocurrency per day. The fiat withdrawals and deposits allowed for Qualified accounts are $10,000 per week and around $50,000 (EUR or USD) per month. HitBTC offers a complex but informative interface for seasoned traders, and those who are looking for a platform where they can trade smoothly. It might not resonate well with newcomers and first time investors, but the interface is welcoming for the experienced. Detailed charting is provided by their special ‘Trading View’, and a pop-up feature is available for in-depth chart analysis. The instrument list is placed next to the pop-up and is divided into four major categories. The order book is neat and appears at the end of the page. There is a news section which may come in handy when major news is breaking, you will quickly be alerted to it. The HitBTC fees structure is one of the most competitive models among cryptocurrency exchanges. They only ask for 0.1% of transaction charges from takers (people who sell crypto-assets or post ask-requests). On the contrary, unlike other exchanges, they reward the makers with 0.01% rebate on their orders. The makers are the ones who buy crypto-assets or place bid-requests. This very much encourages users to buy and not to sell, make sure you have a plan when you begin trading. There is no deposit fee for any cryptocurrency, but there are certain withdrawal fees that vary from currency to currency. Usually they charge only the network fee of the particular cryptocurrency, for Bitcoin it is 0.00085 BTC and for Litecoin it is 0.001 LTC. HitBTC is certainly cheaper than a lot of its competitors, for instance Coinbase charges almost 1.5% from its users and if you are using credit card or debit card, you might have to pay around 4% of the transaction. Bittrex charges around 0.25% and for many other exchanges 0.25% is the standard fees. HitBTC is one of the only few with such low fees and a rebate for makers, something that rarely exists elsewhere. Customer support of HitBTC is not talked about very highly on social media platforms. The customer service executives are slow and do not respond as quickly as they should. HitBTC has a live-chat available in multiple languages, but customers issues appear to be in the ‘pending’ mode for a long time. HitBTC might have many advantages and upsides, but the disadvantages are so major that they cannot be ignored. Out of all the downsides of HitBTC, it is the slow-withdrawals that they need to work upon to retain their users. Withdrawals not reaching customers on time, and lost-trades are the most frequent complaints from users. If they resolve some of these issues and focus on improving the experience of their users, they might have a higher user base in future.